Cuba Wedding, Cuba si ! …that can easily come true! Getting married in Cuba, nothing complicated, and what a magnificient location! Thee majority of the hôtels offer complete wedding packages, well framed and cheap! This is for a Legal and recognized wedding or symbolic. 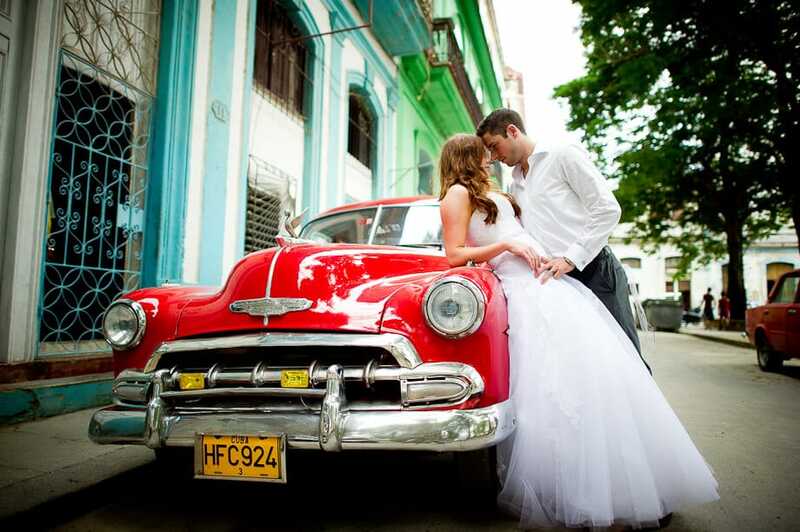 The bride and groom require a 3 days minimum stay in Cuba prior to the wedding date. No family member (blood relative) can act as a witness, if only family are present at the ceremony, the hotel will provide witnesses. Cuba is performing a lot of changes in their hotel complexes. Many Resorts have now open and we are more than happy about this. Contemporary design & zen with a great service. Finally some high-quality wedding hôtels. Planning a free wedding in cuba ? A very unique charming destination, Cuba is proposing a various dream sites to celebrate your South wedding. Let Blue Sky Destination Weddings help you to plan the most important day of your life together with your travel consultant, right here prior to your departure. Currently the most popular hotel in Cuba is the Pullman. Since its opening in December 2015, we have organized more than 11 weddings at this property. The average price per adult is between $1050,00 et $1300,00. Cayo Coco, Cayo Santa Maria, Holguin, Santa Lucia, Varadero are all beautiful locations for a destination wedding. You will fall under the charm of the immaculate white sand beaches and its turquoise sea. Cuba is particularly renowned for its rum, to be safe and the heat of the people. Treat yourself with the beauty of a beach wedding and this, at a very good budget. It is possible to celebrate a civil or symbolic wedding for the same price and sometimes for free. A free wedding package, why not! 1 – If you have never been married before, you only need a valid passport during your stay in Cuba as well as of tourist’s card. 2 – If one of the two spouse has been married before he needs, in addition of the valid passport and tourist’s card, to provide the following documents: -if divorced: his act of birth and his divorce certificate; -If widowed: his act of birth, his wedding certificate as well as the death certificate of his spouse. Make sure that all your documents like birth act, divorce confirmation, wedding or death certificate are translated in Spanish, notarized and registered by the Cuban consular representative of your country (service fees applicable). 3 – Furthermore, you must submit a document on which you will enter your name, address , profession, your level of studies, your citizenship and finally the entire names of your parents, alive or deceased. Enclose a copy of your passport to this document. Please forward by fax, to your hotel in Cuba or via your travel agent, copies of all documentation parvenir par fax, à votre hôtel à Cuba ou via votre agent de voyage, des copies de tous les papiers (y compris ceux qui sont mentionnés plus haut si vous avez déjà été marié), in Spanish and this, at the latest three weeks minimum prior to your arrival. We offer a turn-key service. Please contact one of our wedding specialists to assist you for all required documentation. Witch is the budget to get married in cuba? For the travel part, taking as an example a departure from Montréal airport. Regarding the departure date, this is extremely variable. We will do our best to provide you an estimate but many factors are not considered in this example. Starting from (between $850,00$ andt $1500,00) per adult. Free package with a minimum of guests. Some hotels will charge from 500 CUC.